The configuration files are located on $HOME/.turses directory. contains user preferences: colors, bindings, etc. Each user account that is no the default one needs to be aliased and has its own token file alias.token. And, after authorizing turses to use that account, a token file named work.token will be created. Optionally you can create a work.config file for a configuration specific to that account. you will be logged in with the previously stored credentials. Here is an example with two accounts apart from the default one, aliased to alice and bob. The configuration file is divided into sections, each of which is described below these lines. The timelines section of the configuration has been deprecated, use sessions instead. The file with the session declarations is located on $HOME/.turses/sessions. sessions is a ini-style configuration file in which each section represents the layout of a session. The defaults session is loaded when no other section is present. The visible option must be present for any session but buffers is optional. This section allows you to configure the settings related to the Twitter API. However, we recommend you to use HTTPS, especially in open WiFi networks where anybody could be sniffing packages and reading your personal information and communications. The other available option is update_frequency which controls how often (in seconds) the timelines should be automatically updated. Almost every action within turses is configurable. The defaults resemble some of the bindings from the vi editor. To see an up-to-date description of all the available actions open the help buffer pressing ?. turses uses the representation of keystrokes provided by urwid to map the bindings to actions. You can change the colors of different elements of the UI in turses. The legal values for colors are listed in the urwid wiki. This section allows you to onfigure the styles for some of the UI elements in turses. Below is a description of all the configuration options in the section. header_template: The header of a tweet. dm_template: The header of a direct message. tab_template: The text in a tab. username: The author of the tweet. retweeted: The value of retweet_indicator if the status is a retweet. retweeter: The name of the retweeter (if any). time: Relative time of the tweet. 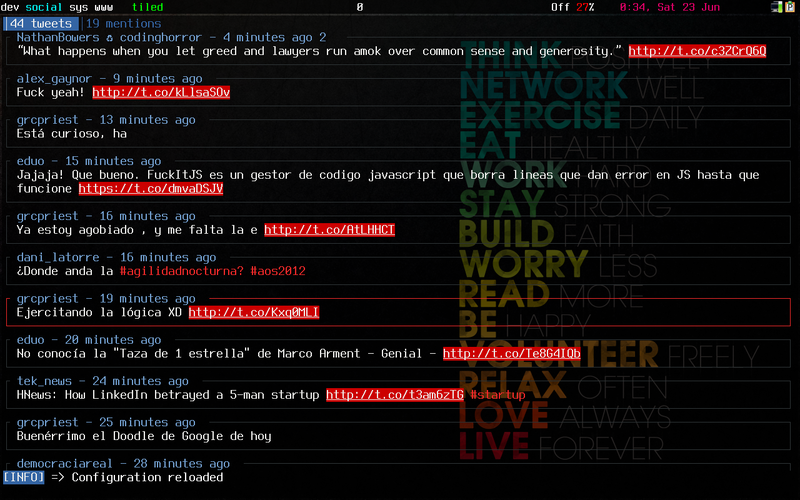 reply: The value of reply_indicator if the status is a reply. retweet_count: The number of retweets. 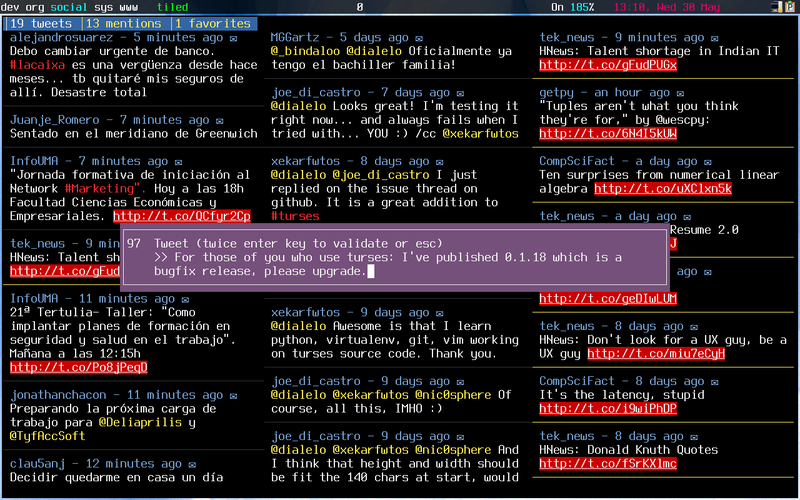 The reply_indicator and retweet_indicator values will be surrounded with spaces. sender_screen_name: The sender of the message. recipient_screen_name: The recipient of the message. time: Relative time of the message. timeline_name: The name of the timeline. You can configure how tweets are rendered. By default the statuses are enclosed in a box, but you can use a divider instead. When setting box_around_status to false you can specify a divider character that will be printed below the statuses. When you are focusing a status and press i, turses will show a popup with information about the author of the status. 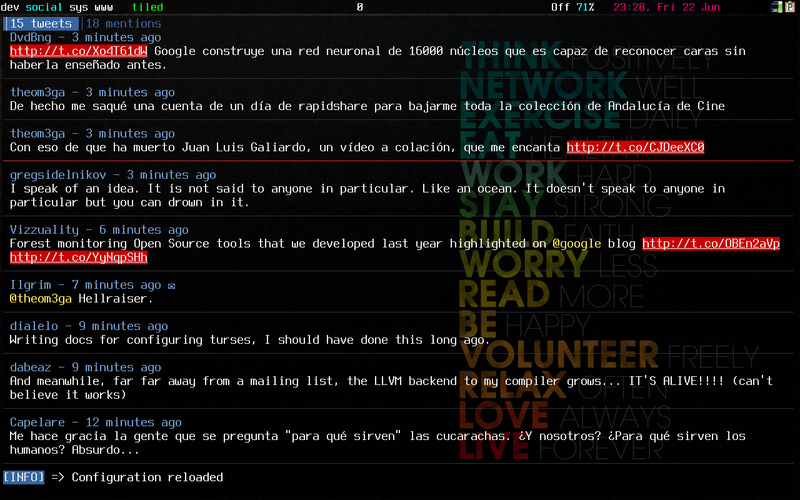 At the bottom of the information widget the last statuses posted by the user are shown. The last section of the configuration is debug, which is intended for developers.